How did we get into farming? Dane and Rachael enjoyed their previous decade(ish) as professional outdoor educators with the outdoor school NOLS. Both share a love for working in beautiful outdoor settings around the world, teaching, and working in a profession that supports their values. NOLS is an excellent non-profit built upon the belief that wilderness expeditions provide an ideal venue to foster leadership skills. These skills are transferable to all aspects of participants lives and Dane and Rachael apply them to their work on the farm regularly. Through this time Rachael and Dane were inspired by efforts to address food sovereignty and environmental sustainability. Rachael started and operated a CSA distribution business in Oregon. Dane enjoyed the hands-on learning of the Practicum in Sustainable Agriculture at the UBC Farm in Vancouver. After years of traveling Dane and Rachael have been desiring to make a home and invest in a community. They feel so fortunate to be making Powell River their home and to act as stewards of the land they are farming. Aligning their work with their values is a top priority for Rachael and Dane. They believe that growing healthy food organically to be enjoyed locally is a small but vital step toward a more sustainable future. We choose to farm because we desire to be of positive impact for our community in this changing climate we now live in. We choose to farm because we value our strong work ethic and want to invest our energy into a place. We choose to farm because we love working outside and want to be stewards of the land we farm and live on. We choose to farm for the opportunity this occupation provides for continuous learning about this skill and ourselves. Lastly we choose farming because we want a job that allows us to work together. Paradise Valley Produce is focused on sustainable farm practices and owners Rachael and Dane are invested in being stewards of the land. Our farm follows organic principles to grow produce in a manner that is healthy for people and the ecosystem. We are building healthy soil through extensive cover cropping. We utilize crop rotation to minimize the impacts of pests and plant diseases. Rather than spraying toxins, we work to control weeds through seed bed preparation, by using mulches and landscape fabric to cover bare soil and through good ol' hand weeding. We practice Regenerative Farming which is an agricultural practice focused on rebuilding soil, restoring and enhancing soil biodiversity and ecosystem health. 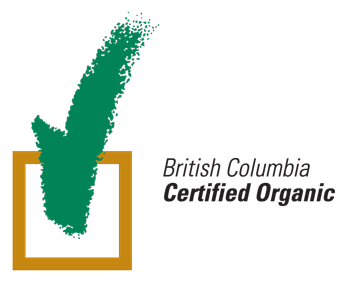 Programs and certifying bodies our farm is supportive of are: COABC, OMRI and Young Agrarians. The property we are farming was originally a goat dairy in the early 1900's. The dairy farm was known as Myrtle Grove Goat Dairy in Paradise Valley and was managed by Gertie and Tom Lambert who both lived on the property. According to Barbra Lambert's 2015 book"Homesteading and Stump Farming on the West Coast, 1880–1930", Tom Lambert named the valleyParadise as a joke after the area was burned to the ground in 1918 and looked horrid. The area, now recovered from the devastating fire, is known as "Paradise Valley". We had the pleasure of meeting Barbra Lambert who filled us in on the families history on the farm. She has written many books about Powell River and the surrounding area's history.